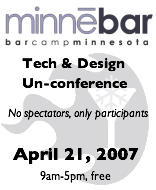 myDigitechnician: MinneBar: Only One Week Away! You still have an opportunity to participate in one of the four best tech events of the year in the Midwest! MinneBar, http://barcamp.org/MinneBar, is happening in the Minneapolis/St. Paul area only seven days from now, on 21 April 2007. Or six days from now if you count the pre-event mixer on Friday night. Go to the event's website listed above and add your name to the list of participants. If you don't want to mess around figuring out how to add your name to the wiki, send an email to me, bwaldron [at] gmail dott com, and I'll add your name to the list. There is no cost for you to attend this technology unconference. You can participate even if you decide to show up at the last minute and didn't register. The important thing is to show up and to participate in the event. As the ad for the event says, "No spectators, only participants." Barcamps are unconferences with the session topics determined by the passionate interests of the tech enthusiasts at the event. If you're interested in being part of the road trip to MinneBar, contact me at the above address. We're still figuring out the details of who is driving and when we'll be at various points along I-94, but we'd love to have a convoy headed over to the Twin Cities. *Especially* join us if you have a mobile internet connection that we could share amongst the convoy so we have connectivity all the time on the road! The plan is to leave sometime Friday (morning?) so we get over to Minneapolis during the afternoon. We can connect with other tech people if we get there early, then go to the pre-event mixer on Friday evening. For those unfortunate people who have schedule conflicts and can't make it to MinneBar, make sure you clear your schedule for BarCampChicago. The date hasn't been set, but it will likely be in June. In case you were wondering, the other three "best tech events in the midwest" are BarCampChicago, BarCampMilwaukee and BarCampMadison.